With six teams tied at 1-1-0-0 after the first week of play in Canada West, there was hope that we'd see some separation between the teams as Week Two got underway on Friday. Well, there was some definite movement in the standings after this weekend's games, and we'll take a look at who did what and what affect those actions had. Needless to say, some teams moved up while others moved down, and the only question was which way did your team go. Let's get those questions answered with today's edition of The Rundown! UBC at MOUNT ROYAL: Two of those 1-1-0-0 teams met Friday night in Calgary as the Cougars hosted the Thunderbirds. Both sides came out of the gate flying as they went up and down the ice, but MRU got an early advantage when UBC's Celine Tardif was sent off for bodychecking at 5:18. Mount Royal went to work, and they capitalized just five seconds into the advantage when Daria O'Neill notched her first goal with a shot from the point off a clean face-off win that got through both the traffic in front of the UBC net and UBC netminder Amelia Boughn to put the Cougars up 1-0! UBC battled back, though, and they found the back of the net at 12:47 when Mathea Fischer unleashed a bullet that Mount Royal goaltender Zoe De Beauville couldn't stop, and the two teams would go to the intermission tied 4-4 in shots and 1-1 in goals! Both Boughn and De Beauville came out with bricks and mortar in the second period as they both put up walls in their respective nets as neither team could solve the goalies. MRU did outshoot UBC 6-5, but we'd forge ahead to the third period in searching of goals to break this stalemate. Despite these two teams having several stern discussions with one another during breaks in play, neither could find the back of the net. In a scarier situation, Ireland Perrott was helped off the ice following an awkward fall with a few minutes to play, and she did not return. Let's hope she's alright. With the horn ending regulation time without a winner, we'd go to overtime for a little extra time fun! Both teams had chances in the four-on-four overtime, but neither Boughn nor De Beauville flinched through the first five minutes of extra time, so we'd go to the three-on-three OT period. It was here where MRU's Megan Carver was whistled for a slash, and that gave UBC the opportunity they needed. Celine Tardif's shot with 14 seconds to play was the deciding blast as her shot eluded De Beauville for the 2-1 UBC double-overtime win! Boughn earned her first win with a 20-save performance while De Beauville suffered the loss after making 21 stops. UBC at MOUNT ROYAL: I was expecting an appearance from Mount Royal backup netminder Emily Severson in this game, but the Cougars went back to De Beauville. UBC predictably turned to Tori Micklash for this game, so it was game-on for Saturday! Both teams brought a determined effort in this game as they went up and down the ice, but nothing would find twine until the 13:59 mark when Jenna Fletcher's shot found room past De Beauville to put the T-Birds up 1-0! Just 1:38 into the middle frame saw the Cougars down by a pair when Emma Hall struck for the Thunderbirds to make it 2-0. MRU's Morgan Ramsey would be given two minutes to reflect on a bodycheck she threw at 2:48, but UBC would cut that time short when Ashley McFadden's shot found the back of the net at 3:56 for her first Canada West goal off Rylind MacKinnon's third helper of the night to make it 3-0 for the Thunderbirds. Clearly, the two UBC goals in under four minutes was not how Mount Royal wanted to start the period, but they regrouped and mounted a few offensive bursts of their own. Micklash, however, stared down all attempts to preserve the 3-0 lead through forty minutes of play. Despite outshooting the T-Birds 6-5 in the third period, Micklash was perfect on this night as MRU could not solve her. UBC played solid defence in front of their goaltender, and the result was a 3-0 win! Micklash stopped all 16 shots she faced for her first shutout of the season while De Beauville stopped 16 of 19 shots in the loss. SASKATCHEWAN at CALGARY: Saskatchewan entered the weekend at 1-1-0-0 after their split with Alberta while the Dinos hosted their home-opening games with an 0-2-0-0 record following a sweep at the hands of the Manitoba Bisons. It wouldn't get any easier for the Dinos as they welcomed the other half of the last season's Canada West Final to Father David Bauer Olympic Arena. And it went pretty much how one would expect with Saskatchewan carrying the play in the first period to a large degree. If it weren't for another spectacular period by Kelsey Roberts who made 15 saves, this game may have gone off the rails early for Calgary. Instead, we went to the first intermission with no score despite the Huskies leading 15-4 in shots. Just ten seconds into the middle frame, Delaney Frey was caught for slashing to join Merissa Dawson in the sin bin from the end of the fist period, and the Huskies went to work on the five-on-three power-play. 40 seconds after Frey was sent off, it was 1-0 for Saskatchewan when Leah Bohlken continued her torrid start to the season by notching the power-play marker past Roberts from the top of the face-off circle for her third goal of the season. The lead would be short-lived, though, as Calgary responded just 1:58 later. Rookie Elizabeth Lang continued what she started in Manitoba as she potted her third goal of the season in as many games past Jasey Book as she finished off the three-on-two to make it a 1-1 game at 2:48! The scoring ended there, however, as the teams tightened up the defence and the goalies did their part. Through two periods, Saskatchewan held a heavy advantage in possession, a major lead in shots at 23-8, but the teams were deadlocked at 1-1! It was only a matter of time before Saskatchewan finally broke through Roberts' wall, and they finally got the goal they needed late in the game when Bailee Bourassa found a wide-open Kayla Kirwan in front of Roberts, and the Huskies forward made no mistake in beating the Calgary netminder at 15:25 to put Saskatchewan up 2-1! Calgary would press late, pulling Roberts for the extra attacker with 57 seconds to play, but they wouldn't solve Book again in this game as Saskatchewan skated to the 2-1 victory! Book made ten saves in the win while Roberts was outstanding with a 30-save effort in the loss. SASKATCHEWAN at CALGARY: In the second-half of the weekend series, it felt a lot like the first game in terms of how the opening period was played. Saskatchewan came out flying, dominated both time of possession and shots, but were thwarted time and again by Calgary's Kelsey Roberts. Like the night before, there was no score between the two teams despite the Huskies holding a 13-2 advantage in shots. Like they did in the first period, Saskatchewan carried the play again. However, on one of their few opportunities, they mad eit count! The Calgary Dinos grabbed the lead as Holly Reuther's centering pass was perfect in finding an unchecked Sara Craven at the top of the crease, and the Dinos forward made no mistake in beating Jessica Vance at the 14:19 make to put the home side up 1-0! Kelsey Roberts was still the big story as she was keeping the Dinos in this game far more than she should have need to as Saskatchewan held a 21-5 lead in shots through two periods of play. An early third-period penalty on Rachel Paul at 1:27 for holding put the Huskies on the power-play, and they'd use it to tie the game. Kayla Kirwan scored her second goal of the weekend as she beat Roberts 29 seconds after Paul sat down in the penalty box, and this game was knotted up at 1-1. Both teams traded chances, and Jessica Vance needed to be at her best when she robbed Chelsea Court from claiming a game-winning goal, but there would be no winner found through sixty minutes so we were rewarded with free hockey! In the four-on-four overtime period, the Dinos actually had the Huskies pinned in their zone for periods of time, outshooting Saskatchewan 4-1 in the five-minute span, but no goals would be recorded. In the three-on-three period, a scramble in front of Vance resulted in a two-on-one the other way for Saskatchewan, and Bailee Bourassa made the right decision in keeping the puck as she wired a wrist shot over Roberts' glove for the overtime winner at 3:48 of the double-overtime period for the 2-1 win! Vance picked up the win in stopping 20 chances while Roberts suffered her fourth loss of the season despite making 37 saves. MANITOBA at ALBERTA: In the last five seasons at Clare Drake Arena in Edmonton, the Pandas have literally owned the Bisons with a 7-1-0-0 record. Manitoba, who entered the weekend with a 2-0-0-0 record, were looking to continue their two-game winning streak against the Pandas that they posted in Games Two and Three of the Canada West Semi-Final last season, including that exciting 1-0 Game Three final that went to four overtime periods! Would the Pandas continue their dominance over Manitoba at home? I'll answer this one upfront: yes. The Pandas controlled the game from start to finish, and looked entirely like the best team in Canada West. Lauren Taraschuk was peppered early and often, and a Megan Neduzak penalty for holding at 6:05 was the first break that Alberta needed. Autumn MacDougall would bank a pass from behind the net off Courtlyn Oswald who was defending out front, and Taraschuk had no chance to stop the puck as the Pandas grabbed a lead on the power-play at 7:29! At the end of the period, it was all Pandas as they held a 1-0 lead on the scoreboard and an 11-2 advantage in shots. Alberta would continue their solid play in the second period, but Manitoba had chances on Dayna Owen. The only problem was that Owen was ready and willing to stop all shots as the Pandas closed out the period with the 1-0 lead intact and an 18-7 advantage in shots. Manitoba needed to come out in the third period and get a goal, so they mounted furious pressure with a total of zero shots in the period. Yes, you read that correctly. Erica Rieder did hit the goal post with a shot, so it wasn't like they went twenty minutes without a shot, but they had no recorded shots on net as per the boxscore. With no recorded shots, that means there were no goals, and that means the Pandas took this game by that 1-0 score! Owen earned her first shutout in stopping all seven shots she faced while Taraschuk made 23 saves in suffering her first loss in ten months! MANITOBA at ALBERTA: Manitoba certainly wouldn't have been happy with their performance one night earlier, but there's something to be said with Alberta kicking off the season against both Canada West finalists from last season. Head coach Howie Draper certainly had them ready, and the Pandas came to play once again on Saturday. Alberta started Manitoba-born netminder Halle Oswald in her first Canada West game while the Bisons were without leading scorer on the blueline Lauren Warkentin after she suffered an arm injury the night before. Would the changes make any difference? Alberta brought the heat in the opening frame once more as they sent wave after wave of attacks at the Bisons only to be turned away by Lauren Taraschuk on all 13 opportunities. Oswald wasn't that busy at her end of the ice in making just six saves, and these two squads would enter the first intermission with no goals recorded. The second period was a lot like the the first period with Taraschuk being the busier netminder and the Bisons chasing the puck. Autumn MacDougall has a glorious chance stolen away by Manitoba's big netminder, but the lack of execution by the Bisons was the bigger story in this period as they were once again outshot 11-3 and trailed 24-9 at the second intermission. If it wasn't for Taraschuk, Alberta would have built themselves an impressive lead by that point. The third period saw the special teams come alive for the Pandas, and that led to the opening goal of the game. Taylor Kezama broke out of her zone, escaped the checking of Karissa Kirkup, and spotted Alex Poznikoff who skated right by Alison Sexton in to open ice where she collected the pass and sniped a beautiful goal past the glove of Taraschuk just 42 seconds into the period while shorthanded to put the Pandas up 1-0! And they weren't done there. Hannah Olenyk's shot zipped by Brielle Dacquay-Neveux and got through Taraschuk on the power-play at 13:23, and that was more than enough for the Pandas to ice this game as Manitoba couldn't solve Oswald with their eight shots in the period as Alberta posted a second-straight win via shutout with the 2-0 victory! Oswald won her first career start in Canada West with a 17-save shutout - also her first shutout in her career - while Lauren Taraschuk suffered her second-straight loss in a 27-save effort. REGINA at LETHBRIDGE: Normally, games between Regina and Lethbridge have little fanfare. It is expected both of these teams will compete for the final two playoff spots once all is said and done this season, but tonight's game featured a little record breaking as one player went off and did something pretty amazing. We'll get to her performance in a second, but let's get down to business with the goal scoring. Both teams dame out a little more on the defensive side as it appeared neither wanted to make the first mistake. Midway through the period, we finally got some solid offence as Martina Maskova showed some impressive speed in tracking down a loose puck that slid a little too far for a breakaway, but she turned it into a solid wraparound that got past a laterally-moving Alicia Anderson as Maskova got to the post first, and the Regina Cougars grabbed the 1-0 lead at 10:48! The remainder of the period would see an uptick in the offensive chances, but the Cougars closed out the period with the 1-0 lead and the 8-7 advantage in shots. Early in the second period, Lethbridge's Alli Borrow beat Jane Kish with a shot, but the iron behind Kish kept the score at a 1-0 game. Whatever was said in the dressing room by head coach Michelle Janus seemed to resonate as the Pronghorns were certainly the more lively bunch in the middle frame, but it would Regina who doubled their lead. Lilla Carpenter-Boesch sent Jordan Kulbida streaking down the wing with a pass before she cut to the middle and made a great deke on Anderson to score on the backhand to make it 2-0 for Regina at the 12:30 mark! Despite being outshot 16-9 in the period, it was Regina leading by a pair of goals after two periods! Again, the Pronghorns brought every bit of offensive they could find in the third period, putting pucks on net from every angle at every opportunity. The only problem was that Jane Kish had other ideas about this offensive onslaught. Brett Campbell and Alli Borrow were stoned on the power-play early in the period. Tricia Van Vaerenbergh was turned aside on a couple of opportunities. Kenzie Lausberg was denied on an outstanding post-to-post save by Kish. When the dust settled, the Pronghorns had outshot the Cougars 22-8 in the period and 45-25 on the night, but the final score was 2-0 in favour of the Cougars! Jane Kish was simply incredible in stopping all 45 shots she faced for the shutout while Alicia Anderson made 23 stops in the loss. It is here where we'll write a little history because Jane Kish broke the Canada West record for most saves in a shutout performance on this night with her new 45-save standard! Kish broke a record shared by former Regina Cougar Jennifer Schmidt, set on October 18, 2013, and by Lethbridge's Alicia Anderson one week earlier. Her shutout was also the eighth of her career, tying the school record held by Schmidt. Needless to say, Friday night was a pretty historic night for the 21 year-old Kish when it comes to the record books at Regina and in Canada West! Congratulations, Jane! REGINA at LETHBRIDGE: For the first two weeks of the Canada West season, defence has ruled the conference for the most part. We've seen a team hit four goals in a game just once - Manitoba over Calgary - and we've seen a combined five goals scored by both teams in one game just three times in 15 games this season. Regina and Lethbridge decided to show the rest of the conference what goal scoring looked like in this game. These two teams came out flying with chances at both ends of the ice early on. Jordan Kulbida's slash at the 4:28 mark put the Pronghorns on the power-play, and they would cash in. Mattie Apperson found Alli Borrow open, and the Pronghorns sniper finally found a way to beat Jane Kish with her shot at 5:09 to put Lethbridge up 1-0. Late in the period, a harmless-looking shot from the wall by Jordan Kulbida handcuffed Alicia Anderson in the Lethbridge net, allowing the puck to find the twine as Regina tied the game at 14:55. The teams would head to the intermission knotted up at 1-1 with Regina holding a 14-11 edge in shots. Early in the second period with Jodi Gentile in the sin bin, the Cougars power-play went to work. Jordan Kulbida fed Nikki Watters-Matthes, and she went high on the glove side past a screened Alicia Anderson for the 2-1 Cougars lead at 3:51. Later in the period, the Regina power-play struck again from the same combination of players as Kulbida fed Watters-Matthes, and she went high over the glove of Anderson again, this time from the top of the face-off circle, as Regina jumped ahead 3-1 at the 12:28 mark. Kish, however continued her stellar play in this period, denying all 13 shots by the Pronghorns as the third period loomed with Regina out in front. Kish brought the solid goaltending into the third period as she denied all chances on an early Lethbridge power-play to shift momentum back to Regina, and they would capitalize once more on a power-play of their own after Tricia Van Vaerenbergh was given a break for tripping a Cougar. Jordan Kulbida would pick up her fourth point of the night when she set up Chelsea Hallson for the power-play marker to make it 4-1 at 8:16, and it appeared that Regina had this one wrapped up. Or did they? Van Vaerenbergh got one goal back when she cleaned up a scramble in front of Kish by potting her third goal of the season at 11:40, and the Pronghorns were down 4-2. They would continue to pressure the Cougars as the game wore on, and they pulled Anderson with just over two minutes to play. That strategy would pay off for Lethbridge as Mikaela Ray was able to score in a goalmouth scramble at 19:20 to make it 4-3! However, Jane Kish and the Regina Cougars were able to weather the final 40 seconds of the game to claim the 4-3 victory on this day! Kish picked up her second-straight win with her 29-save performance while Anderson suffered her second-straight loss despite making 32 stops on the night. This is entirely not about Canada West because there was a pretty big moment that happened out in the Maritimes where the UNB Varisty Reds women's team took to the ice for the first time in a decade! 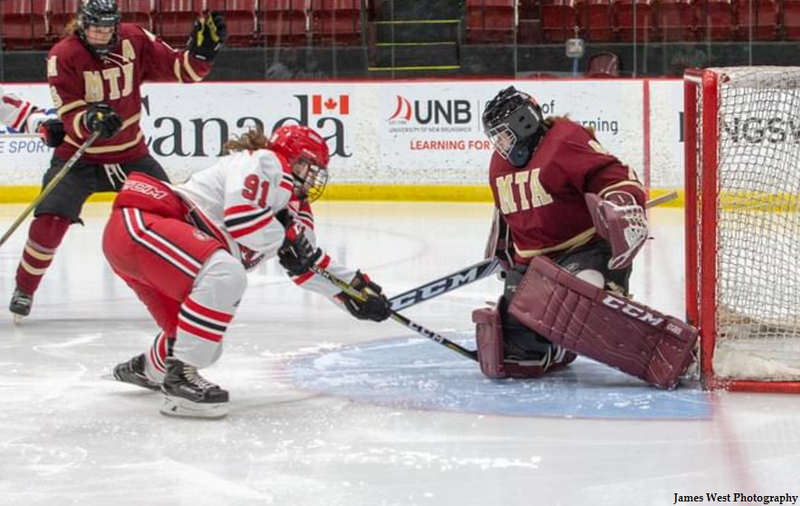 UNB's first game came last night when they hosted the Mount Allison Mounties in AUS action, and the woman pictured in the UNB uniform is Jennifer Bell. Why is she important? Well, she scored UNB's first goal of the season on the power-play just 21 seconds into the second period, so there's a little history for all of you U SPORTS trivia buffs. Unfortunately for the Varsity Reds, they fell in overtime to the Mounties by a 2-1 score, but they recorded a point in their first game back on the AUS circuit! Congratulations to the Varsity Reds on an amazing night of hockey, and you can watch the game in its entirety by following this link and going to the "Archive" section of page!